"We are staging this late intervention because we believe there is a unique window of opportunity for first time candidates to take down several entrenched Republican incumbents on Tuesday," said Ben Wexler-Waite, a spokesman for Forward Majority. Democrats currently control 55 seats in the 150-member House, meaning they would need to pick up 21 seats on Tuesday to capture the majority. Very few are predicting the House could flip, but Forward Majority's investment nonetheless reflects Democratic optimism about significantly expanding their ranks in the lower chamber come Tuesday. Forward Majority was launched last year by alumni of Barack Obama's campaigns with the goal of retaking state legislatures across the country before the next round of redistricting in 2021. Texas is one of six states the group is targeting this cycle as part of a nearly $9 million push. HD-14: State Rep. John Raney, R-College Station, is being challenged by Democrat Josh Wilkinson. HD-23: Republican Mayes Middleton and Democrat Amanda Jamrok are running for the seat being vacated by defeated state Rep. Wayne Faircloth, R-Galveston. HD-26: State Rep. Rick Miller, R-Sugar Land, faces Democratic challenger L. Sarah DeMerchant. HD-28: State Rep. John Zerwas, R-Richmond, faces a Democratic challenge from Meghan Scoggins. HD-45: Republican Ken Strange and Democrat Erin Zwiener are vying to replace outgoing state Rep. Jason Isaac, R-Dripping Springs. HD-47: Democrat Vikki Goodwin is running against state Rep. Paul Workman, R-Austin. HD-52: Republican Cynthia Flores and Democrat James Talarico are competing to replace ex-state Rep. Larry Gonzales, R-Round Rock. HD-54: Republican Brad Buckley and Democrat Kathy Richerson are running for the seat being left open by defeated state Rep. Scott Cosper, R-Killeen. HD-64: Democrat Andrew Morris running to unseat state Rep. Lynn Stucky, R-Denton. HD-65: State Rep. Ron Simmons, R-Carrollton, is being challenged by Democrat Michelle Beckley. HD-66: Democrat Sharon Hirsch is challenging state Rep. Matt Shaheen, R-Plano. 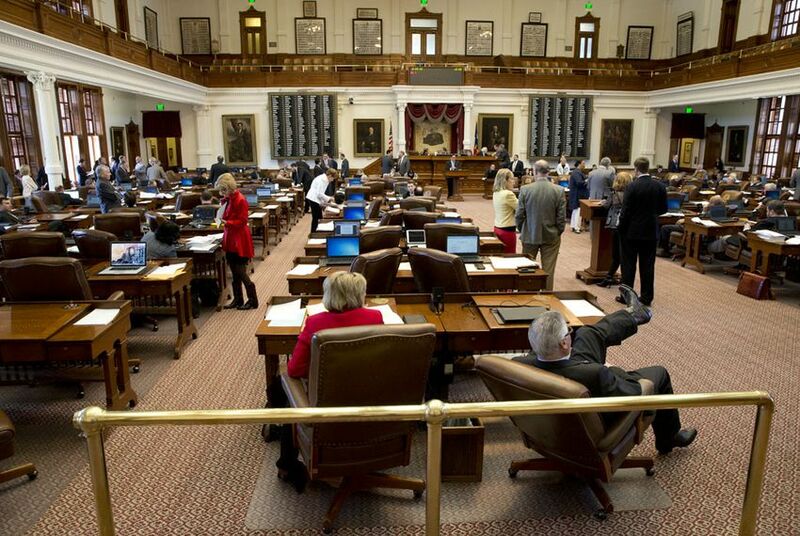 HD-67: State Rep. Jeff Leach, R-Plano, faces a challenge from Democrat Sarah Depew. HD-85: Democrat Jennifer Cantu is challenging state Rep. Phil Stephenson, R-Wharton. HD-92: State Rep. Jonathan Stickland, R-Bedford, is being opposed by Democrat Steve Riddell. HD-93: Democrat Nancy Bean is running to unseat state Rep. Matt Krause, R-Fort Worth. HD-94: Democrat Finnigan Jones is challenging state Rep. Tony Tinderholt, R-Arlington. HD-96: State Rep. Bill Zedler, R-Arlington, faces a Democratic challenge from Ryan Ray. HD-97: Democrat Beth Llewellyn McLaughlin is running against state Rep. Craig Goldman, R-Fort Worth. HD-126: Republican Sam Harless and Democrat Natali Hurtado are vying to replace outgoing state Rep. Kevin Roberts, R-Houston. HD-129: State Rep. Dennis Paul, R-Houston, is being opposed by Democrat Alexander Karjeker. HD-132: Democrat Gina Calanni is running against state Rep. Mike Schofield, R-Katy. HD-133: Democrat Martin Schexnayder is challenging state Rep. Jim Murphy, R-Houston. HD-135: State Rep. Gary Elkins, R-Houston, is being challenged by Democrat Jon Rosenthal. HD-105: Democrat Terry Meza is challenging state Rep. Rodney Anderson, R-Grand Prairie. HD-108: State Rep. Morgan Meyer, R-Dallas, is being challenged by Democrat Joanna Cattanach. HD-112: Democrat Brandy Chambers is running to unseat state Rep. Angie Chen Button, R-Richardson. HD-113: Democrat Rhetta Bowers and Republican Jonathan Boos are vying to replace outgoing state Rep. Cindy Burkett, R-Sunnyvale. HD-134: Democrat Allison Sawyer is challenging state Rep. Sarah Davis, R-West University Place. HD-136: Democrat John Bucy is running to unseat state Rep. Tony Dale, R-Cedar Park. HD-138: State Rep. Dwayne Bohac, R-Houston, is being opposed by Democrat Adam Milasincic. Disclosure: Paul Workman has been a financial supporter of The Texas Tribune, a nonprofit, nonpartisan news organization that is funded in part by donations from members, foundations and corporate sponsors. Financial supporters play no role in the Tribune's journalism. Find a complete list of them here. Clarification: Forward Majority initially provided an incorrect figure regarding the number of candidates the group is helping. It is helping 32 candidates.